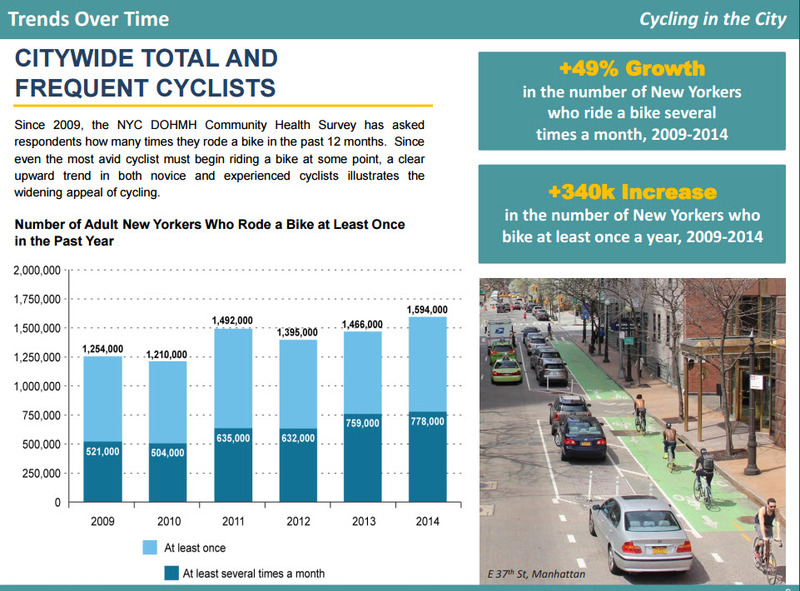 NYC.gov recently released an update on cycling trends in the city. 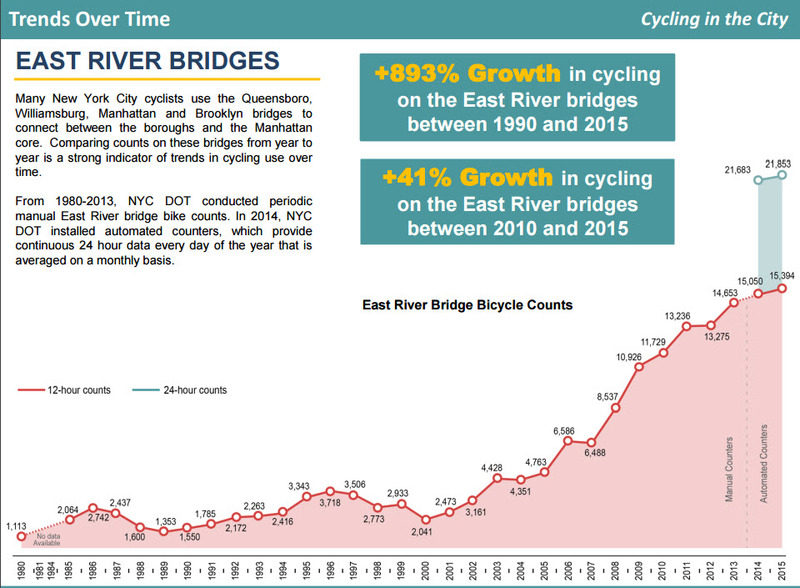 Over the past two decades, New York City has seen tremendous growth in cycling, reflecting broad efforts to expand the city’s bicycle infrastructure. In the mid-1990s, NYC DOT established a bicycle program to oversee development of the city’s fledgling bike network. Since then, NYC DOT has led the charge to build an expansive network that serves an ever growing number of New Yorkers. These efforts were accelerated following the release of PlaNYC in 2007, which set ambitious goals toward creating a more sustainable city, and have been expanded further—with increased emphasis on transportation safety and equity—under the framework of OneNYC. Since 2010, NYC DOT has expanded and enhanced the on-street bike network by nearly 300 miles, including more than 40 protected lane miles, with a record 12 miles installed in 2015. NYC DOT is on track to install even more protected lanes in 2016, with over 15 new miles planned. 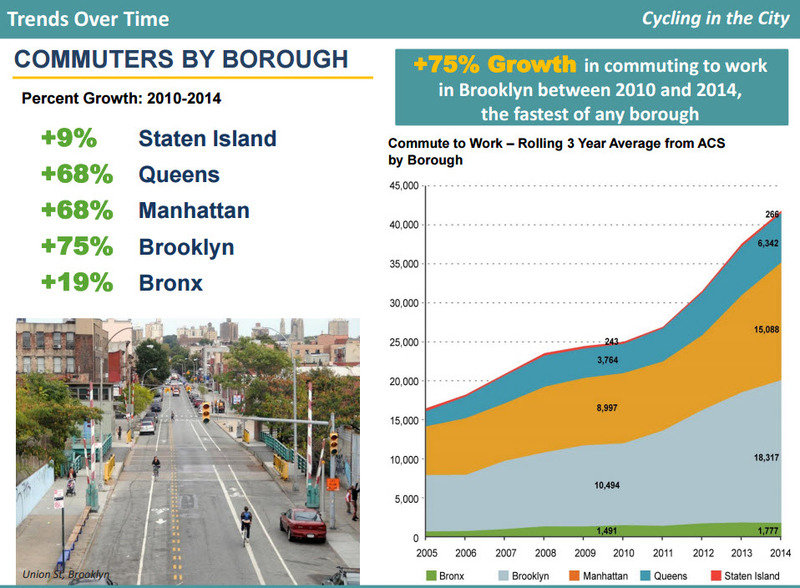 With this expansion of bicycle routes on City streets, along with the miles of new greenway paths in public parks, and the introduction of bike share, there have never been more people biking in New York City. Creation of local bike networks beyond the Manhattan core, in communities such as Long Island City and Brownsville, encourages people to use a bicycle to get around their own neighborhoods to run errands or visit friends. Development of new stretches of path along greenways such as the Brooklyn Waterfront and Bronx River makes it more enticing for cyclists to take recreational rides and provide comfortable spaces for parents with young children to go for family bike rides. Miles of protected on-street bike lanes are emboldening the more cautious and risk-averse New Yorkers to take to the streets on a bike, while Citi Bike makes cycling a more convenient option for quick trips around the city and multi-modal commutes—even for those who do not own a bicycle. 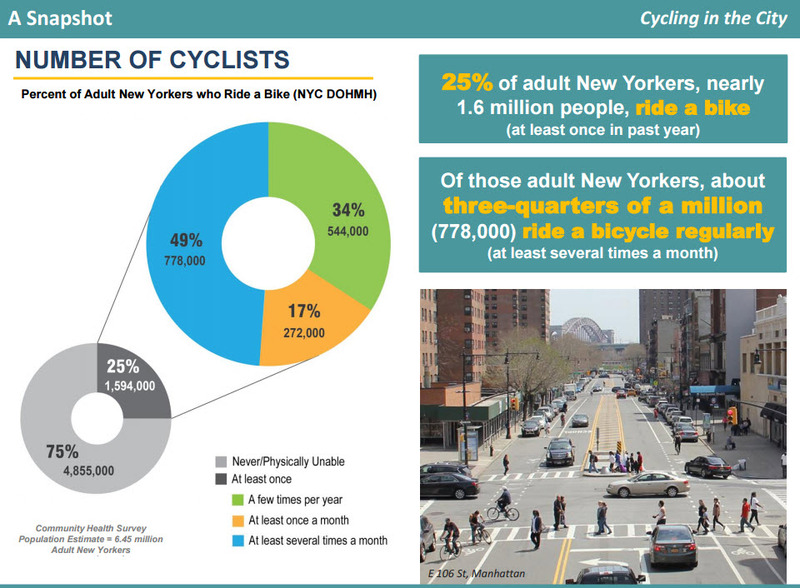 How frequently are New Yorkers using cycling as a mode of transportation? How is that frequency changing over time?